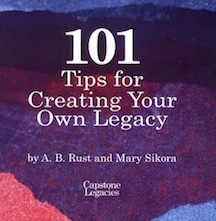 101 Tips for Creating Your Own Legacy is a legacy book that has been used among family members on a long car ride across the country, in senior centers to develop memory books, and as a party theme as well as a great personal book to create your own legacy. At 6” by 6”, this tip book is the perfect companion for pocket or purse. Keep a pencil handy because this book will jog your memories and help you explore the past for a better future. 18 North Fort Thomas Avenue. Fort Thomas, KY 41075. (859) 291-1412. © 2019 Living Magazines, Inc.